There were challenges and games galore at 5th Littlehampton Sea Scouts’ fourth annual fun day. It was the perfect opportunity for people to get a taste of what Scouting has to offer, meet the group’s leadership team and generally have a fun-filled day. It also gave people the chance to see the group’s premises, which are available for hire for functions, at The Gordon Hall, Lineside Way, Wick. Organised by Sea Scout leader Clare Frostick and Beaver Scout leader Laura Stoddart, the fun day on Sunday, May 14, included a crate stacking challenge, air rifle shooting, giant games, a bouncy castle and junior roller coaster. Clare said: “We run the family fun day each year to invite the community in to try something new. The event isn’t about making money, it’s about letting children that are not currently with our group try something new and exciting. “The weather was amazing for us, too. We think that it was our busiest yet. Everyone seemed to be having fun and it had a real sense of community feeling. Group Scout leader Mark Hewson, who is also district commissioner for Arundel and Littlehampton, said the fun day helped to raise the profile of the group. 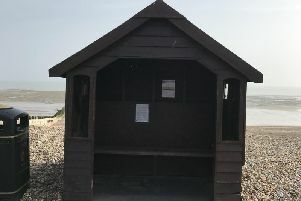 “About four or five years ago, we were about 30 members and as a result of the fun day and the efforts of the leaders here, we are now the largest group in Littlehampton with over 83 members,” he added. “We are always on the lookout for more. We have just opened a new Beaver colony for six to eight-year-olds and we will shortly be looking to open a new Cub pack for eight to ten-year-olds. So, we are looking for adult leaders but we are also looking for young people interested. Visit www.5thseascouts.co.uk/ffd for more information.